I think the World Champion should be determined by a "small" tournament that replaces/combines the candidates tourney. Bear with me here... this is thought out to encourage top play with decisive results through out the year and in the final tournament through "pole positions" and create as many news/talking points for fans. The tourney would be a 6 player round robin (kind of)...here comes the fun part... but with each player playing another 3 times. 15 games per participant. White odds are determined by tournament play through out the year. White odds meaning 3 out of the 5 match ups a player receives 2 of 3 games as white. How are white odds determined? Higest TPR enroute to tournament... however player needs to have played at least one OPEN tournament besides one that may have awarded a position for them. Open tournament needs to have at least 30 gms with 10 players rated above 2650. Next would be the first place finishers for World Cup and Grand Prix. But, but but what about odds for the Champ? Don't they deserve something? Well they are automatically in the tourney. If they want a chance at white odds then they need to play at least 5 tournaments through the same time line as other participants and at least one needs to be an Open tournament. Again the open tournament needs at least 30 gms with 10 players rated above 2650. If this is accomplished then the four players will draw straws to see who gains the odds. Now that would be an exciting 2 years and something to fight for. An aside is that the championship tournament would take place between 6-8 months after all determining factors have been met. Would just need to figure out who/what decides wild card... drawing of lots for the top 15 fide rated? Perhaps a match play off between rapid and blitz World champ if one isnt the classical champ. Just throwing things out there. No need to eat our young yet. the idea to play a whole match after a very short while if the result is a draw is very interesting. I like it, but unfortunately I doubt it can be organized. It would mean that FIDE should find a second sponsor who would accept that the deal will not necessarily happen. This is very difficult, since finding a sponsor even for a sure deal is a very difficult task as well. All in all, I doubt that would be possible. But if it is, then it sounds great. We need to think it through as well. What happens if the second match is drawn as well? I agree. If you cannot beat the champion, you do not deserve to be champion. 6-6 is a tie, Magnus wins and it is over. @lajosarpad - The last (classical) game of the match, the short draw from the 12th game between Magnus and Sergey, was good for both players only because they knew thay had the Rapid and Blitz tiereakers next. If the rules had stipulated no tiebreaks in case of a tied match, that is, if that 12th game was the last game to be played in the match, believe me, they would've fought it out with all they've got; especially Karjakin --the challenger. 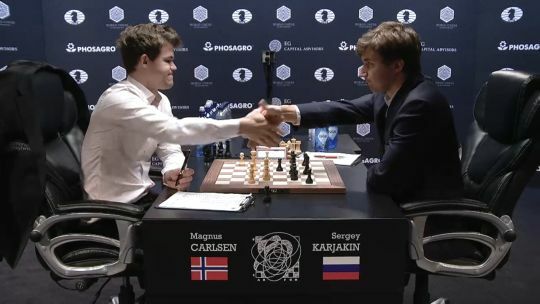 For if Karjakin didn't win that final 12th game, that's it: his chances of becoming the new Classical World Chess Champion would've ended right there, and the only thing for him to do would've been waiting for the next Classical World Chess Championship cycle to start. Now, I think you do have a point when you mention that if the rules allowed the players the possibilty of a second match, in case the challenger and current champion tied the first one (--i.e., my suggestion--), then they, the players, might find it convenient to make a quick draw in the last game of a World Championship match --assuming they were still tied at that point--, so they can continue playing with renewed strength next time (in their second match). I agree with Seirawan that the current format of 12 games is too short. It will make the players too cautious; one loss in such a system could mean the end of the world to the loser. Which is why the recent world championship was perhaps too careful, they were more eager to play carefully than let loose their talents on the chessboard. The 24 game rule is much better in that it'll give the players more confidence to fight for a win (hence, better play) because they'll have more time and games to take more risks. 24 games is not too long, and it's definitely not short, so it's just right. The tiebreak at the end of a 24 game match which awards the title to the world champion is the best solution to such a result in that the match will end immediately and it compels the combatants to do their best in winning the title. @Resistance, I cannot tell you what Seirawan wants (but we have a very good idea if we read the article), but I, for one do not want a clear winner. I want to see great games. I have absolutely no problem with a last game being drawn if it is a fighting one or becomes dry due to logical circumstances and not to the players' desire. The problem in our case was that a draw in the last game was good to both players. If it was not the case, then at least one of them would have been fighting. Secondly I agree with Seirawan that rapid games do not really decide who the better player is. What if one of them runs in the other's novelty in a rapid game and has no time to think it through over the board? It is bad luck. But when it comes to "bad luck", then the match loses its power to prove who the better player is. Therefore, having a 13th game instead of a rapid playoff makes sense. The point where I do not agree with Seirawan is that his proposal features coin flipping to determine who is the person who has to win the last game. If the coin flip is done after the 12th game, then the players might still feel to be on equal grounds throughout and would not really fight, hoping for their lucky stars. If the coin flip happens before the match, then there are chances that the World Champion would be the one who has to win the last game, but then we reduce the Champion to the role of challenger, while the challenger would have a privilege. I believe the classical way to decide who the champion is is much better. If there is a draw at the end of the match, then the champion will retain his title. This will make sure that the challenger will actually act like a challenger and will challenge the Champion. I have no particular problem with Karjakin's approach to play solid games, as this was, according to his judgement the best approach, but I would expect the challenger to challenge. A rematch in the case of a draw would not really help in my humble opinion. Just imagine the case when there is a World Champion who is much better than the challenger and is afraid of another potential challenger. In that case the world champion, when he reaches 6 points will purposefully lose the remaining games to make sure a rematch will happen and the challenger will be the one who he is not afraid of. This could prevent players who might actually be better than both contestants to have a shot to the title. The system should prevent that. The idea which would grant a privilege to the first winner makes sense, but in that case a clear decision should be made for the case when all games were drawn. However, if we choose this approach, then the last player winning to have drawing odds would make more sense logically and would make the match more interesting as well. Seirawan gave a brilliant idea to make the presticuous match become more interesting. By this way at least FIDE must think and improve the match way! Seirawan gave a brilliant idea. At least make FIDE think how to make the presticious match become more interesting! Several posts under this article are in favor of (in one way or another) using as a tiebreaker the fact of winning a game first in the match. For me, it would be more logical, for this, to take games by groups of two games (each player having White and Black in each pair of games). Otherwise, it gives an advantage to the player who has White for the first game - for example, if this player wins the first game, he has "automatically" won the tiebreak : for me, this system gives too much of an advantage to the player who begins the match with White. On the contrary, using groups of two games wouldn't favor one or the other player, and it would nonetheless permit to use results obtained in classical games as a first tiebreaker. I don't like your proposal, Yasser; I don't think it's very good. Firstly, Rapid, Blitz or 60 minute games --or anything below the standard rate of Classical Chess-- are considered improper as tiebreakers for deciding the Classical World Chess Champion in cases where we have a tied Classical World Chess Championship match, because they cheapen the latter's value, not because unknowing people might get confused by the final result (--"Is he the rapid, blitz or classical world chess champion? ", "¿Why is the classical championship being decided by blitz tiebreaks? ", etc.--). And they cheapen the title of Classical World Chess Champion because of a their lower quality, and because they do not allow for better chess, given the shorter time controls. Longer time controls allow for better, more beautiful chess, and, very importantly, longer time controls allow for much better chances of successfully implementing higher conceptions deviced at the board ---longer time controls stimulate players to come up with more beautiful, interesting conceptions: they stimulate chess players to create. The problem with the 13th game proposal is that it ALSO introduces an alien, disfiguring, corrupting element to Classical Chess: you're forcing the players to produce a decisive result no matter what. Though they have proved to everyone already, through 12 long and disputed Classical chess games, that neither one of them is better than the other, you are forcing them to decide the whole thing in one last, desperate shot? To force a decisive result, at such an important event, just because you don't like it when there is no clear victor, it's contrary to the spirit of the game. For sometimes you are simply no better than your opponent. Even if your perceived strength is acknowledged as superior to that of those you play against, that doesn't mean you'll beat them everytime you play against them. --Why?-- Because chess is a very complex game: not even the world champion is above its complexities. He might not be able to win every game he sets his mind to, and he might even lose from time to time! ---"Well, that's chess you know: one day you give a lesson, the next day you get a lesson" (words from one of the most admired and beloved chess champions there ever was). Maybe the champion retaining the title after a tie is not that bad an idea. After all, if the challenger wants to be regarded as the true champion, he got to prove it. And that means he has to beat the reigning one (--if the challenger can't beat the reigning champion, he cannot be called the champion; period--). But since the champion couldn't beat the challenger either, then staging a rematch might not be such a bad idea in order to decide who the real champion actually is among those two. It would be like a tiebreaking match, so to speak: same number of games, same rules, not very far away in terms of time from the previous, tied World Championship match (say, no more than a month or two apart, so excitment is still fresh in the minds of the audience). If there is also a tie, in this second tiebreaking match, then the World Champion retains his title and the challenger, which has proved to be a worthy chess opponent for the champion, gets seeded in the next Candidates Tournement. I think there is one more downside of blitz (or worse, armageddon) as a World Championship decider. In my opinion, on principle, you should not have to be physically able to play blitz in order to compete for the world title. You may be unable to move fast as a consequence of a physical disability but still have high-level grasp of the game. There are blind chess players, chess players with sclerosis, chess players with no arms. They don't play blitz but some of them play chess well enough to beat me. Of course, such players make sure never to get in time trouble. But time trouble is the whole point of blitz. I think chess is for everyone. If your mind is functioning, a physical disability should not be a showstopper for anyone reaching for the very top. The only physical demand should be endurance. You have to be able to play for hours on end, day after day. A physical disability may not be permanent. Imagine the match going into blitz, and one player dislocates his right arm on the rest day playing basketball. Back at the board his chess is as good as before, but with his lefty he topples the pieces. That decides the matter. Blitz is a game of dexterity as much as of chess skill. Bullet even more so. How you move your pieces and handle the clock becomes very important. And that is simply not what a world championship should be about. @ BrunoBanani : One thing that I can't really understand is why everyone seems to think that, for tiebreaks, there must absolutely be, at the end, a "two-results-only" game (Armageddon), or else another system that guarantee a strict global time-limit. While it is obvious that, if the players where simply to play blitz games until one of them wins a game, it would be quite impossible to see endless series of draws ; it never happens in blitz games. As an aside, I am not at all particularly a proponent of rapid and blitz tiebreaks, but the fact that there can be rapid and blitz tiebreaks in a given "classical chess" competition (even in a World Championship) doesn't bother me very much either. I would personnaly quite prefer to see a series of blitz games, as an ultimate tiebreaker, than an Armageddon game - for me, Armageddon is to "artificial" ; it isn't really chess. The only problem would be, in the case of an "unlimited" series of blitz games, how to determine which player would have White for the first of these "ultimate" blitz games. In a World Championship, in my opinion, it would be rather obvious that, logically, the first White should go to the Champion (it is only a small advantage, but the Champion demonstrated before that he can be "The Best" - in a way -, and it seems to me normal that he can gain some sort of an advantage because of that). @ GrayDuck : 1) Can you imagine that in twenty years, we will still study rapid (or blitz) games of today ? Very obviously, the answer is "no". So, if we want to have real immortal masterpieces, there is only one way : classical chess. And computer games or suchlike cannot at all be compared to human masterpieces ; what interests me (and many other persons) is to see the greatest possible human achievements in chess and not at all a supercomputer playing against another supercomputer. @Peter B: are you kidding? Carlsen was not convincing at all, and even if he was faster and luckier in rapid time controls, he was NOT AT ALL convincing with longer classical controls. Actually, it seems to me that Karjakin was even better and more solid and he missed a clear win. The fact that the world championship was decided in a rapid game is nothing short of a farce! Mikhail Tal in his time could have been the best player in the world in Blitz but he was far from being the world champion: imagine one drawing the classical games in order to win just because he is a faster player! Rapid and Blitz games in a world championship match are nothing but farcical. 1) Neither player should be given an advantage before the match - the former champion should still need to win the match in order to keep the title, having a 13th game where the player with black only has to draw gives this player an advantage. Why should the champion be given some advantage? 4) I agree that 12 games feels to short, it is maybe that way for television. Either a 24 game match or first to 12 points might be a good solution. The most logical way is to have a set number of games (more than 12) and if this is drawn to have sudden death - i.e. first player to win a game wins. This would create real drama (which was definitely lacking from game 12 of this match) as players would be aware that one mistake could lose the match and maybe make them more willing to play for a win. I propose 18 games with classical time-control and if 9-9 then 6 playoff games with the same time-control but with the final remuneration of players reduced and title for the first player to win a game. We will see more exciting games and the title I'm sure it will be decided in the first 18 games. In the spirit of Yasser’s suggestion that the match be determined only by classical games, my proposal is as follows. If the match is tied after 12 games (or 14 or 16, perhaps another discussion, but note that the candidates round robin is 14 rounds), then the match goes to a three-game playoff. One player gets white all three games, but the player with black gets “draw odds” (wins the match with 1 ½ points). Two permutations: (1) the colors are either determined by lot, OR the colors are determined by the current world champion; and (2) the games are either played normally OR should the player with the white pieces elect to open games two or three with the same first move as game one, that player may request that the player of the black pieces respond with a move different from what was played in game one. I agree with Seirawan. Since there are separate world championships for Rapid, Blitz and Classical formats, then these should not be mixed with the one another to decide a result respectively. A round robin tournament or a match could adopt a odd-number of games. Perhaps even a different scoring method - White draws = 1 point; Black draws = 2 points; White wins = 3 points; Black wins = 4 points. With this scoring method, I believe every game becomes more interesting. It is a revolution. I dont like GM Seirawan's solution. It's true that the 13th game is "Classical time control" but the Armageddon flavor makes it not classical chess. I propose this instead: 12 games match, classical time control, first player to win 2 games wins the match. If tied after 12 games then the champion retains his title. If after 12 games no one has +2 then +1 gives you the title. First player to win 2 games would encourage fighting chess. Why not let a draw in match games favor the reigning world champion, and require the challenger to win to take over the title? I think any player has every right to play a quick draw if he wants to, even if it's not so entertaining to watch. Equal score after 12 games leads to exciting tie-breaks and more chess for the audience to consume! Sure tie-breaks are not played on classical time control for obvious reasons and there are always people against it and I respect their point of view. My suggestion is that after 12 games of classical chess it should be decided in an Armageddon, but not in the normal Armageddon format that favors black. There are two additional interesting variants of Armageddon that should be considered. 1) A system of continuing to play games until someone manages to win. In these events, an initial game is played at a certain time control: as an example, let’s say Game/30 with a five second increment. After choosing for colors, the game is played. If either player wins, the match is over. In the case of a draw, however, the players immediately switch colors and play a new game. But this game isn’t played at the same time control; instead, the players must play with the amount of time remaining on their clocks, whether that’s 29 minutes or ten seconds. This process continues (including playing more games and reversing colors) until someone wins a game. 2) Another alternative is to make a slight tweak to the normal Armageddon structure. In some cases, organizers have attempted to use a bidding process in which players bid for the right to play the black pieces in the Armageddon tiebreaker. Players “bid” time; essentially, they tell the arbiter how little time they’d be willing to take on the clock in order to have the right to play Black and get draw odds. In our above example of a G/30 tiebreaker, for instance, one player might bid 25 minutes, and the other might bid 23. The second player would then play Black with 23 minutes on their clock, while the first would get White with the full 30 minutes. I think alternative 1 is easier to grasp in general. That way you can't win on equal score and is easier to explain. ejyutz : Not sure we really need a 'radical' solution, but something has to change. The only tie-break I would suggest would be to the winner of the first decisive game, in this case Karjakin. If all games are drawn, then the current champion hold the title. As a result of this suggestion I would expect even more draws - any mistake and loss means you need to win 2 games. Option would be opposite - winner of last decisive game. And still there might be a match with 12 draws, so what then? "this idea by Seirawan that the World Champion should be crowned strictly based on very slow games"
uh.. It's a classical championship, GrayDuck. If you don't like watching 'very slow' chess, don't. The 'tiebreaks first' idea is better than 'tiebreaks after', which isn't working. Not with separate rapid and blitz championships, it's farcical. So, 'champion retains title' seems simple and best. And obviously 12 games is not enough. Maybe let's use the wisdom of crowds and everybody vote on desired number of games, and use the average. I haven't heard of anyone saying they want LESS than 12! 24 seemed to work ok. I commented above, but I want to address this idea by Seirawan that the World Champion should be crowned strictly based on very slow games. He is overlooking that computers, the internet, and increasing professionalism have changed the nature of the game in several ways. First, “the best possible chess” (ignoring time management and intuition as being part of what constitutes the best chess), as ivan3ivanovich describes, is no longer played at the World Championship. The objectively best moves are now played at the World Computer Chess Championship or in Advanced Chess—not in any human event. We do not recognize those events as the World Championship because time management and intuition are important components of the game. Players of faster games rely more heavily on both skills. Second, chess is rarely played with classical time controls anymore. Of all the games that are actually being played, probably the overwhelming majority are blitz and bullet matches. Players enjoy and value the challenges of managing time and exercising discernment as much as they value running mental calculations. The World Chess Championship should use rules and strengths that are commonly used in actual chess play now, not rules and strengths that were used a century ago. Third, World Championship games are ending in draws far too often. As a result, the matches are boring for spectators and can be decided by one or two mistakes that are unrepresentative of the whole of the match. The World Championship should be composed of queen sacrifices and military-style strategy, not computer-like minutiae with rare deciding mistakes that must be revealed by a computer. We've just had a spectacular rapid playoff. Who's complaining now? Also earlier I said maybe just limit it to rapids, and I still like that. I'd suggest an unlimited number of rapid 2-game mini-matches, with a maximum (say 6 or 8) rapid games per day. Then you might go into a second tie break day, but it'd be very unlikely. A longer match like 16 to 20 games would be great, but someone's got to sponsor it. I am with those who recommend an 18 game match, and the champion retains his title in case of a tie. The world title is indeed the crown jewel of chess, and one has to actually beat the man to take his throne. All this wrangling for spectators (not to mention FIDE's bumbling with the tin-cup tournaments) cheapens the title. I agree with Ehsfrac and others. Best of 18 games is a reasonable compromise. If the challenger can't beat the champion over 18 games (drawn match) then the challenger really can't claim to be the new world champion. The current champion keeps the title as he or she has not been beaten. Rapid and/or lightning games are a joke. As Kasparov once said "Chess is not skittles". There needs to be 18 games of classical time control for the title of world champion . I was not impressed at all with Carlsen . Rapid play has no business in deciding the title of world champion. The sponsors should want to sponsor a good match and not worry about the cost. If done correctly everything will take care of itself. You can't play at the same level in rapid play as you do in classical time control. I hope next time Carlsen will agree to play at least 18 games at classical time control . Longer match and draw odds to the champion makes the most sense. My thinking on the world championship needs to be at least 18 games at classical time control. I don't care what the sponsors would want or the spectators want. To battle for the world championship needs to be done the right way with Classical time controls . To me ,it's nonsense to play 4 games with rapid time control. So, in my opinion , Carlsen didn't prove anything in the classical time control. However, I do think It's up to Karjakin to prove he could beat Carlsen in Classical time control . If the match was drawn after 18 games then the champ keeps the title . In everything there is always advantage and disadvantage. My suggestion is this and I think this is not complicated for readers . If the final score is tied at 6-6 after 12 games, the reigning world champion retains his title, but the challenger will get equal share of the prize. I think this is the best solution, there will be an adjustment in prizes.. No more tie-break. In history,in documentation, in database and in books how can you include the tie break games? It's confusing. But if we just have classical games ( between 12 games to 18 games,) and no more tie breaks ,confusion and complication is gone. When the final score is tied, the world champion retains the title and the challenger gets equal share of the prize. Yes, 12 games is too short. And speed games as tiebreaker are a terrible solution to a drawn match. The World Championship has long ceased to be the "crown jewel of the chess world." There are many more interesting events all year long (despite the World Championship featuring very strong play). The suspended Kasparov-Karpov match of 84 was extremely interesting to me, so of course I'd gladly go back to a similar format. But, as Yasser said, let's assume the chess politicians will not agree to lengthen the match, and think if there is any better way to decide a 12 game match. My first thought is: in the event of a 12-12 tie, neither player wins the World Championship. No champion that year. Each player gets a "loser's" portion of the prize fund. And the rest is rolled over to the next match (like in many lotteries). Both "losers" would get a spot in whatever candidates or qualification cycle is being used; a cycle which would now provide 2 contenders for the next Championship match. This doesn't just require that a challenger defeat the reigning champion to be considered champion. It also requires that the reigning champion be able to defeat a challenge to remain champion. The most important point here is that it gives both players something to play for. In all scenarios of draw odds, (which Yasser's suggestion is aversion of: draw odds randomly assigned to one player who in compensation gets an extra white-- admittedly a clever idea) there is a player who has no incentive to win a game. Thus you have the onus on one player to "create," while the other can just defend and seize opportunities when the other overpresses. I think a far more interesting dynamic is: what happens when both players have a motivation to win. Given that the score in a match of this caliber is very often tied, we would get lots of games where both players have an incentive to win. This leads to more interesting chess! This is one of the reasons most tournaments are more interesting than the world championship: every player has some incentive, some reason to try to win their next game. But in World Championship matches we all too often have one player who has no incentive to win-- that is what dramatically reduces the excitement, and therefore that is what we should try to address. How about 'Golden goal' whereby, if the match is still level after game 12, you keep playing classical games until a player wins one and is declared champion (with no rest days). I realise the tournament organisers wouldn't like this for logistical reasons but tough! Not sure we really need a 'radical' solution, but something has to change. The only tie-break I would suggest would be to the winner of the first decisive game, in this case Karjakin. If all games are drawn, then the current champion hold the title. I'm with Yasser on the main point, that a Classic Chess Championship match should be decided in Classic Chess games, not rapid or blitz. How you structure it is open to discussion. The outcome of this recent match was far less than satisfying. We still don't know who is the best Classic Chess player. I really don't think its the number of games that is the issue. Not that Chess is dead, but there appears to be a number of openings that are worked out so well and used at the highest level to a draw that there is no room for creativity. I had an idea where a committee would somehow devise a way before a match to create a list of thematic openings that the contestants would not have pre-knowledge to. The First 2-6 moves would appear on the board before the match started. Yes, seems strange for the championship of the world to be thematic. Yet, it would be contest of straight brainpower. The contestants would not know what openings were being used or even if they were white or black? It would bring exciting chess back again and give more of a chance of having to be creative at the board!